ASUS has quietly introduced its new video card based on the NVIDIA GeForce GTX 950 GPU with a 75W power limit. By virtue of a lower power limit, this newer design does not require a 6pin PCIe auxiliary power connection and can be used to upgrade even basic PCs. Surprisingly, despite the lowered TDP, the ASUS GTX950-2G card features typical clock-rates and other specificaitons one would expect from a GeForce GTX 950. The sub-75W video card market is an important one, as many desktop PCs supplied by well-known brands lack even basic upgrade capabilities. To cut-down their costs and improve cable management inside their systems, PC makers sometimes reduce the number of power connectors to a minimum they need to build their systems. As a consequence, it gets impossible to add a new hard drive to such computers, or install a higher-performance graphics card due to lack of necessary additional power connectors inside the box. When NVIDIA designed its Maxwell architecture years ago, the company put a lot of effort into improving relative energy efficiency of its then forthcoming GPUs and into cutting their absolute power consumption as well. As a result, the first Maxwell-based GPU, GM107, consumed only up to 60W even in its most powerful desktop configurations (i.e., GeForce GTX 750 Ti) and was widely used inside notebooks. The majority of GeForce GTX 750 Ti video cards did not require any additional power connectors and could be used to upgrade any PC because any PCIe x16 slot can provide up to 75W of power. The more advanced GM206 GPU, based on the second-generation Maxwell architecture, has a TDP of up to 120W, which means that video cards based around it have required additional power. As a result, the GeForce GTX 950 and the GeForce GTX 960 video cards are not as OEM PC-friendly because they require one 6-pin PCIe auxiliary power connector. Nonetheless, ASUS has been able develop a GeForce GTX 950 video card that can be installed into almost any PC with sufficient space inside because its power consumption is just 75W. The ASUS GTX950-2G comes with 2 GB of GDDR5 memory clocked at 6.6 Gbps, a dual-slot dual-fan cooling system with an aluminum heatsink, one DVI connector, one HDMI 2.0 port and one DisplayPort output. ASUS did not lower frequency of the GPU and did not alter its configuration, though as we've seen with past attempts to produce lower power SKUs, it's likely that this card has a reduced hard power limit to stay under 75W and may be more likely to power-throttle as a result. The GPU features 768 stream processors, 48 texture units, 32 ROPs as well as a 128-bit GDDR5 memory interface. It can work at 1051 MHz base clock and at up to 1128 MHz in boost mode (when OC mode is enabled). Perhaps the most interesting aspect of this video card is that thanks to the underlying GM206 GPU, it's the first sub-75W card to gain full hardware-accelerated decoding and encoding of H.265 (HEVC) video, and it fully supports HDCP 2.2 content protection over HDMI 2.0. This will likely make the ASUS GTX950-2G a popular choice for HTPCs as a result. Conversely, due to low-power nature of the graphics adapter, the ASUS GTX950-2G may not be the best overclocker. For those, who would like to push a GeForce GTX 950 to the limits, ASUS offers its ECHELON-GTX95-O2G and the GTX950-2GD5 video cards that have power and cooling headroom as well as components with enhanced durability (the ECHELON model). 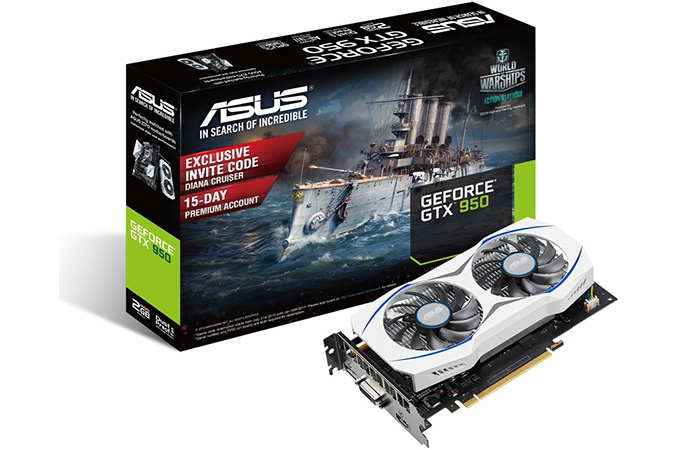 The ASUS GTX950-2G graphics card is listed at ASUSTeK’s web-site, but is not yet available for sale anywhere. The price of the product will remain a mystery for now, but I do not expect it to be significantly higher than NVIDIA’s MSRP for the GeForce GTX 950 — $159. Meanwhile the card also qualifies for ASUS's ongoing World of Warships promo program, and as a result comes with a code for the game's Diana Cruiser along with 15 days premium credit for a new account. 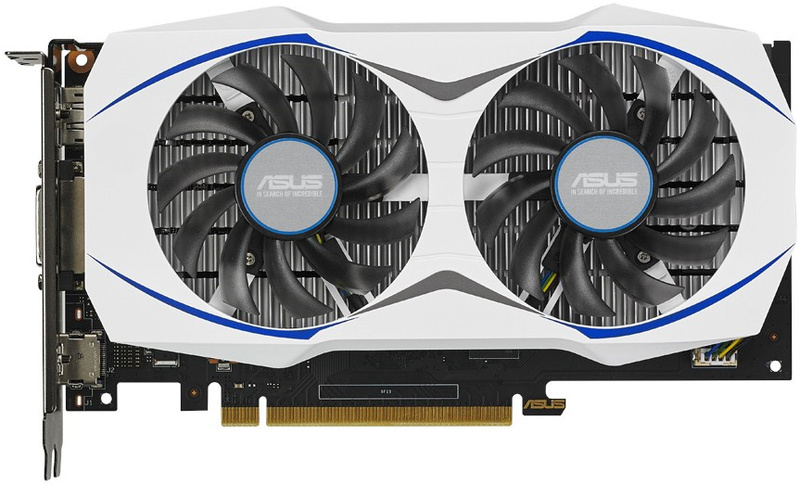 UPDATE: ASUS has also added the Mini-GTX 950 2G into its linep. The card comes in mini-ITX form-factor, consumes up to 75W and does not require external PCIe power. Source: ASUS via PC Perspective. because it's a cheap, huge aluminum block that isn't as efficient as heatpipe heatsinks are at dissipating heat.